Though Father’s Day is passed, I couldn’t help but write about what was going on in Huron County, Michigan, while I was in the backyard playing baseball with the kids. Turned out, the kid was a boy. And he wasn’t five or six, he was seven. He was flying down the road, though—70 when the police found him racing down a rural road, standing up on the floorboard so he could work the gas and see over the steering wheel. Two Huron County deputies boxed in the Sunbird and managed to stop it on the side of the road. They found the boy barefoot and dressed in pajamas. Crying. You can imagine the shock those deputies must have felt. You can imagine that shock was doubled when the boy told them what he was trying to do. His father’s home was twelve miles away. The boy was staying with his mother and stepfather in Sheridan Township. He took the car while his stepfather was gone and his mother was asleep. Woke up that Father’s Day morning, and just wanted to see his dad. I’ll be honest—that broke my heart. Yes, he could have killed himself. Or someone else. And no doubt he caused a considerable amount of grief to his mother, who was contacted shortly afterward by the police department and had no idea her son was gone. But to me, those things matter little. They’re relegated to the periphery of this story—there, but not enough to matter. What matters, what I cannot get out of my head, was that this boy simply wanted his father and his father was not there. Why, I don’t know. There are a great many reasons why mother and father divorce. Some are valid, many are not. Regardless, I doubt this young boy cared what those reasons were. And rather than suffer the silence most children of divorced parents must endure, he took it upon himself to do something, regardless of how dangerous that something may have been. He wanted to see his dad, and he was going to do whatever was needed to do it. I can’t get that out of my thoughts. This post isn’t meant as a denouncement of divorce or proof that regardless of what experts say, children are not always the emotionally pliable and resilient people they are made out to be. No, this post is about the importance of being a father. Of being there for your children and being a part of their lives. Of allowing yourself to be present regardless of the situation. I think men tend to define their lives by the work they do. If one man is introduced to another, the first question after pleasantries are exchanged is invariably, “So what do you do for a living?” Always that, at least in my experience. I suppose this is mostly due to the fact that ours is a gender given to action rather than reflection. We men enjoy doing, getting things done. And I’ll say that’s me at times, though I’m trying to be better. I’m trying to understand that my life won’t be judged by the job I have but the life I live. It’s the difference I make, not the money. I figure I’ll be doing well if I inspire in my children the sort of love and devotion that would push them to go to any lengths to see me, if only for a few small minutes. I figure I won’t be doing well at all if they have to steal a car in order to do it. There are statistics galore that prove beyond all doubt the importance of a mother in a child’s life, but let me tell you this: fathers are just as needed. Good fathers, present fathers, loving fathers. Just ask a barefoot and pajama-clad young boy alongside a country road in Michigan. Because but for the grace of God, that could be your son. The bad part about my son getting sick is that he’s sick and my heart breaks with each cough and hasty trip to the bathroom. The good part about my son getting sick is that I often get to take a day off work and stay home to help him recuperate. That’s how I spent last Thursday. Him and I together on the sofa, he with a blanket and his DS, me with pen and paper. The goal was a simple one—to get him better, and to get me a thousand words on my next novel. Of course, goals seem to fly out the window when it comes to tending to a sick child. Especially when that child is more intent to play and talk than to rest and heal. We reached an agreement when we both decided watching a movie was what we really wanted to do. He voted for Star Wars. I voted for Lord of the Rings. We compromised for Pirates of the Caribbean. More movie. A buried treasure. A battle at sea. But by then those things didn’t matter much because my son had begun playing his favorite game. It started with a book he brought home from school one day filled with all sorts of questions. Would you rather this or would you rather that. Some were comical—Would you rather eat boogers or lick a frog’s face? Others were difficult—Would you rather hit a game-winning homerun or score a game-winning touchdown? A few were even thoughtful—Would you rather make someone’s wish come true or make your own wish come true? You get the idea. He was enthralled. And as I subscribe to the philosophy of I-don’t-care-what-you-read-as-long-as-it’s-not-Tiger Beat when it comes to my kids, I allowed it. Sometimes I think that philosophy needs to be reexamined. Because after an entire day of playing Would You Rather, I decided I Would Rather Not. Things like the fact that he’d rather live an exciting life than a long life. And that he’d rather wait for spring than wait for winter. 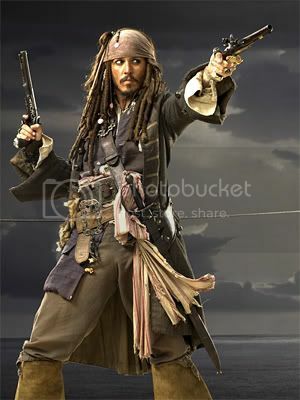 And my favorite—that he’d rather have me as a dad than even Captain Jack Sparrow. I suppose in a way games such as this play an important role in a young child’s life. It gets them used to making choices, and life is nothing but a series of choices. Would you rather be someone else or your best self? Would you rather not risk failure or chase your dreams? Would you rather suffer a broken heart or never dare to love? Would you rather spend your eternity with God or apart from Him? See what I mean? Choices. That’s what life is all about. That’s where our battles are fought. Where our present is made and our future fashioned. There are fewer places more depressing to be nowadays than at the gas station. Especially around here, where those tiny hybrid cars are known as “roller skates” and spoken of in the same mocking tones reserved for liberal politicians and terrorists. Everyone has an SUV here. Or a jacked-up truck. Or both. Having to spend close to a hundred dollars to fill up your tank does not make for a pleasant experience. It also invites certain periods of discomfort and outright sadness when waiting in line at the cash register. Which is what happened to me the other day. And strangely enough, it had nothing to do with gas. Their short conversation would have likely been an interesting one, but my attention then turned to the mother and son in front of me. Both wore the dull layer of weariness common to a hard life, she in her baggy sweatpants and flannel button-up, he in a pair of too-short jeans and a Wrestlemania T-shirt. The mother sighed often—I think it was the deep, tired sigh that drew my attention away from the farmer and the cashier—her hand gripping a twenty dollar bill as if she were trying to squeeze out the ink. Bored with standing in line, her son wandered away to the candy aisle. Mama’s eyes followed him and then drifted to me. “Hello,” she said. I helloed back. He held up a bag of Big League Chew, the grape flavored. Not my first choice, as the regular flavored was much better, but still a valid request. Every boy worth his salt is a Big League Chew fan, my own son included. I thought at that moment that maybe I should grab him a bag, too. He’d like that. I stole a look at the tiny orange sticker that had been placed just under the batter’s chest on the bag–$1.29. Rather than answer, mama gripped her twenty harder. But Jimmy wasn’t about to let silence be her final answer. The line moved forward. Mr. Farmer Guy was gone now, as was the lady behind him and the man behind her. It was now an elderly man’s turn to excoriate the poor cashier on evil oil companies and corrupt government officials. Mama and Jimmy were next in line, and the question of the Big League Chew was still in the air. The elderly man left—“Damn oil companies” was his parting shot—and mama and Jimmy moved to the register. “No,” she said. Jimmy had by then managed to sneak the bag of bubble gum onto the counter in a desperate attempt to somehow leave the store with it, but mama’s eyes caught it. I could see the tears in Jimmy’s eyes and thought there were perhaps tears in his mother’s as well, and I thought then that the four of us—mother, son, cashier, and me—were being privy to yet another example that life is unfair. That no matter what we do or how hard we try, some children will always want and some parents will never be able to provide. I blame the wedding for all of this. The royal one, I mean. William and Kate, the Duke and Dutchess of…something or other. Yes, it’s all their fault. I share part of the blame, of course. I didn’t have to record their nuptials, even if my daughter looked at me with those pleading eyes and asked me to do so. And I didn’t have to let her see the ceremony. Or the pretty white dress. Or the fancy church or the waving crowds and the first kiss. Didn’t have to. But I did. Those pleading eyes are going to get me into trouble someday. Now I have to deal with the aftermath of all this. Since then, my little girl (MINE, mind you) has been all atwitter about her own wedding. She’s made lists. Many lists. What kind of dress she will wear, where the ceremony will be, what sorts of flowers, what colors. She even told me I should go ahead and put in for vacation now, just in case I won’t be able to in fifteen years or so. Because despite race or age or ethnicity or faith (or lack thereof), all fathers share this one thing in common—they will always see their daughters as little girls. Their little girls. Daughter and I are in the truck, on the way home from a stop at Lowe’s. Conversation is both light and shallow, touching upon school and work and writing. “What if it rains?” I asked. “But I ponder it a lot,” she said. I looked away and through the windshield. Fiddled with the radio. Rolled the windows down a little more. Anything to distract her, to get her mind off a subject I had no desire whatsoever to elaborate upon. And, truth be known, I thought that maybe it would have been better if my son were sitting in the backseat of the truck and not her. Because we would be talking about baseball and dirt and mulch. I understood those things. Those things, I could freely talk about. “I wonder where he is,” she said. I doubt I can fully describe the magnitude of what she said. Suffice it to say it was enough for all the blood in my body to succumb to dread and pool in the toes of my boots. My arms went numb, my vision fuzzy. And I swear my heart stopped beating. I’d never thought of that. I’d never paused and considered the fact that the boy my daughter will someday marry is alive right now. Growing up, just like her. We drive home in silence, each of us staring out the nearest window. Thinking about him. For my daughter, I have no doubt her thoughts revolved around how handsome he was and how kind. How he was perhaps a farmer or a scientist or a teacher. For me, I thought more of who he would be than what, and what his parents were doing about all of that right now. Were they teaching him about honor and respect? Responsibility and hard work? Were they instructing him of the proper way to treat a woman? Were they slowly indoctrinating him to the truth that life is a hard thing and that love is a fragile one? Because one day the little girl in the backseat of my truck—my little girl—will be shared with someone else. The heart she has given me will be his. She will lean on him and love him and trust him, not in the same way she does with me now, but in a way similar. The radio station went from commercial to a song we both knew. George Strait is a favorite in our home. He sang, I hummed. My daughter hummed, too. And when he reached the chorus, we both sang. It’s a love without end, amen. “It’s over there,” he tells me, and then points a bony hand to the left side of the windshield. “Don’t think we can get there from here,” I say. My son wrinkles his brow. He knows I’m right; we’ve been on this road before. Many times. I nod and say “Guess so,” not surprised by his sense of fairness but still happy to see it in full display. There aren’t a lot of kids in this world who are okay with sharing. Especially when what they’re sharing could be millions of dollars. The sun is out now, the air sticky and warm, a sharp contrast to what the weather was just a short time ago. The storm was a mean one, the sort of tempest that Virginia is known to have in springtime. Wind and water and thunder. It passed us over and rumbled away, leaving behind an eerie calm and a giant rainbow outside the kitchen window. I called the kids to have a look, more interested in their reactions than the rainbow itself. My daughter ooh’d and ahh’d as she is wont to do. True to her artsy-fartsy personality, the immediately grabbed a notebook and began drawing one of her own. I looked. Sure enough, it did appear to end smack in the middle of Mr. Coyner’s field. To be honest, I didn’t. I had a lot to do. But then I realized that it had been a good long while since I’d gone looking for the pot of gold at the end of a rainbow. And besides, Mr. Coyner’s field was right down the road. “Let’s go,” I told him. Ten minutes later, we’re on a dirt road that is alive with birdsong. The field is just ahead. My son is telling me what he’s going to do with the money he finds. He’ll split some with Mr. Coyner, he tells me again. And of course there’s what’s due to God (“He made the rainbow, after all, so I reckon I’ll just give it to the church.”) And he was going to let me quit my job and just write books that everyone would read and let his mother quit teaching and we could all move to an island in the ocean and swim with dolphins. I had to admit, it sounded pretty good. He nods, says I’m right, and I start to feel a little sorry for him. I think about the homework assignment he did the other night. The lesson was about needs and wants, and he had to draw a picture of each. Under the Wants section, my son drew a cheeseburger. Under the Needs, a hundred dollar bill. That’s my son, the budding capitalist. His dream is to be rich. The field now. No matter how philosophical I can be, no matter how much I lie this time, nothing I can say will convince him of anything other than the truth. And because there is no rainbow, there is no gold. And because there is no gold, there will be no needs met for my son today. My son shrugs. His bottom lip is stuck outward. It’s his usual pouting posture. He walks beside me, looking back over his shoulder every few steps. Just to make sure, he says. Call it the first stage of an important lesson. Life is all about wants and needs and being able to tell the difference between the two. He has those a little mixed up at the moment, but he won’t for long. He’ll learn as I’ve learned—that the dream isn’t something we need as much as something we want. What we need is the journey to it. Took a day off from work a while back to do something I haven’t done in about twenty years—go on a field trip. My daughter’s class was to spend the day at a local university, and she was psyched for some Daddy Time. I was pretty psyched my own self. That goes to show you how long it’s been since I’ve been around about sixty third-graders. Any thought that our time together would be both quiet and alone was quickly put to rest with the appearance of one of my daughter’s friends, who sat with us on the bus. The little girl’s name still escapes me, though I’m sure she mentioned it. Many, many times. Mentioned quite a few other things as well. Many, many times. Country folk like me (the men in particular) tend to shy away from calling people by their given names, opting instead for nicknames of their own creation. There is an art to this. A good nickname is comical but not mean, and usually connotes a certain physical attribute or facet of personality. I tell you that so I can tell you the nickname I’d given my daughter’s friend by the time we hit the interstate. Because she never shut up. That was the moment I paused and asked my daughter if she would mind switching seats. There would be more room for us if I was at the window, I told her. It was a lie, of course. But the truth was that I wanted to use her as a sort of human shield, and I couldn’t tell her that. For her part, Gums didn’t mind. She could talk across my daughter to me just as easily. I had a headache the size of Texas by the time we got off the bus. We made our way into a ballroom, the setting for most of the day’s activities. Seven people to a table. My daughter sidled up to me in her chair. So did Gums. Third grade fieldtrips seem to revolve around crafts. I’m not a craft sort of guy. My little girl is (thankfully), though I still had to pitch in with the glue, the tape, and the stapler. Likewise Gums, who managed to staple both herself and me to the mask she was making before we finally got everything straightened out. That’s how most of the day went, my arms tired from my daughter clinging to them and my ears tired from the chorus of “Daddy, look!” and “Hey Mr. Coffey, c’mere!” It didn’t take me long to realize I’d never make it as a teacher. The ride home was interesting. Me mashed against the window, my lap filled with a ceremonial mask made out of construction paper and fake feathers and a drum make out of two popcorn containers. Mass hysteria from the seats behind me, teachers fighting the good fight to keep everything calm. My daughter laid her head on my shoulder. I saw her smile, and I knew the day had been worth it. A smile from her is always worth it. I didn’t mind Gums talking the rest of the ride home. And to be honest, I kind of felt bad for nicknaming her Gums (though she seemed to enjoy it quite a bit). But I learned a lot on that field trip. Not just how to make ceremonial masks and drums, either. I learned a little something about kids, too. About how they need something else besides food, water, shelter, and love.